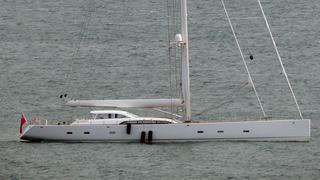 The 46 metre sailing yacht Unfurled has been delivered. She recently left the Dutch shipyard Vitters where she was built and has been spotted on Marine Traffic visiting several ports in the English Channel on her way to warmer climes. Unfurled is the latest yacht to be built by Vitters and the highly secretive project was reported to have been launched in October. This high performance aluminium sloop is the first collaboration between Vitters and renowned Argentinian racing yacht designer Germán Frers. Both the design studio and the yard have a long track record of high-performance cruisers, so their joint experience make for a great combination. Together with the active involvement of the experienced owners, the teams have created a powerful contestant for the regatta circuit. The naval architecture and technical elements of Unfurled are part of the owners’ clear vision for a fast but comfortable sailing yacht. Although Unfurled is primarily designed as a cruiser, a great deal of attention has been dedicated to performance and sailing abilities. The owners and build team made distinctive choices in the design, engineering and outfitting which will characterise the performance parameters of the yacht. An innovative design feature on Unfurled is the retractable pods for propulsion, which were a challenging addition for the yard’s team to engineer and build. For ease of handling with a short-handed crew, two sail stowage drums can be found under the foredeck. This unique headsail storage system was developed in-house for the handling of large code sails. The yacht also features twin carbon rudders that combine with Vitters’ signature rudder feedback system. Tilting platforms at the helm stations will enable the owners to steer stress-free for longer periods of time during regattas. The sleek and elegant design is typified by a stylish flush deck, and Oliver Stirling is responsible for the contemporary interior. This comfortable design includes a spacious and comfortable full-beam owners’ stateroom, with his & her bathrooms, and two guest staterooms with ensuite bathrooms situated aft. Last year Vitters launched the 85 metre Aquijo in a collaboration with Oceanco. 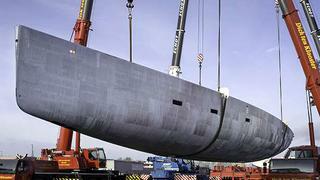 The Dutch yard is now constructing the new J Class Svea.